Earlier this month, we explained how everyone pours bacon grease down their drains, even though they really, really shouldn’t. That blog made us wonder why, exactly, that keeps happening. The conclusion we came to is that we all tend to think of bacon grease as waste. We usually dispose of liquid waste in a drain, so it makes sense to flush it down. The trick to learning not to flush bacon grease, then, is learning not to see it as waste. Fortunately, once you start thinking about it, it’s easy to see bacon grease as valuable. It turns out, there are about a billion cool things you can do with bacon grease! Some of them are obvious, like using it to cook. Some of its other uses are… less obvious. We’re going to focus on those today, because why not? Here are some admittedly offbeat but still valuable uses for your bacon grease. Hey, you have to get rid of it somehow, so you might as well put it to work! Next time you want to shine your shoes, slap some of your bacon grease on a rag. Rubbing your bacon grease over leather will restore its natural sheen and suppleness. It works for polishing leather shoes, belts, bags, and more. Just work a dab of bacon grease around on scuffed or dirty parts of leather using a rag or cloth. The grease will soften the leather and work away at the stain or scuff mark at the same time. 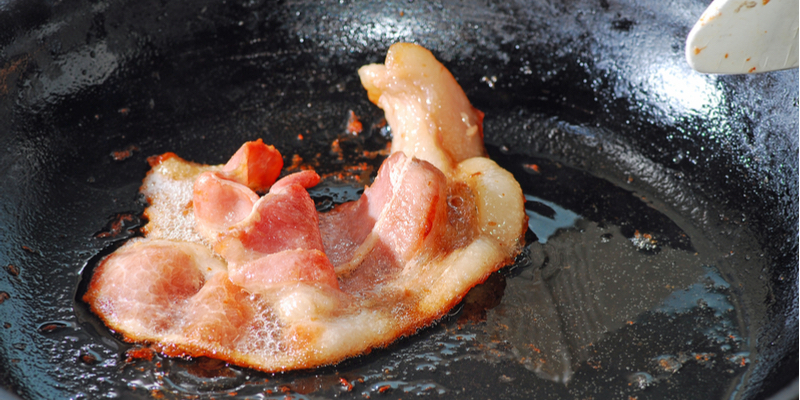 A little grease goes a long way, however, so don’t overdo it unless you want to smell like bacon. Actually, what are we saying? Go ahead and overdo it. One of the worst parts of having a splinter is trying to remove it. Luckily, bacon grease, glorious panacea that it is, can make this process far simpler. Next time you have a splinter, rub just a dab of bacon grease over the injured area. Cover the area with a bandage and let it the grease overnight. In the morning, you’ll probably find that the splinter has come out like magic! The bacon grease temporarily softens your skin, allowing the splinter will fall out on its own just like that. No effort, no painful removal process. Is there anything bacon can’t do? Have a squeaky, creaking door that’s been driving you up a wall? No problem! Door hinges start making noise because their inner components generate too much friction when they rub against each other. Bacon grease can work as a lubricant to reduce that friction and keep things moving smoothly. Next time you have a squeaky hinge, just rub some bacon grease into the hinges with a brush. Be sure to really work it in to achieve the best results. Voila! Now your door should make much less noise when you open and shut it. When it starts making noise again, you’ll just have to cook up some more bacon. Poor you! We told you these were unusual uses! Cracked heels are a very common foot problem. They happen when the heels of your feet get so dry that the skin itself cracks or flakes away. Cracked heels are itchy, uncomfortable, and often painful. They’re also yet another problem your bacon grease can help you solve. Remember how we said bacon grease helps soften skin? Before bed, rub some bacon grease over your heels. Then, put on a nice, comfortable pair of socks and let the grease sit overnight. When you wake up, you’ll notice your heels look and feel a lot better. Just try not to let the smell make you too hungry to sleep! Now we’re talking. Bacon-infused beverages are all the rage in trendy bars and restaurants the world over. It’s not hard to see why. Bourbon, in particular, pairs quite well with bacon, and it’s easy to make. All you need is a strainer, a funnel, some coffee filters, bourbon, and (of course) your bacon grease. Next time you cook bacon, have your funnel and a bowl ready. Pour the beacon grease through the strainer into the bowl. Pour your bourbon into the bowl and mix it with the grease. Let the mixture sit for two hours and then set it in the freezer overnight. The next morning, scrape the fat off the surface of the mixture. Then, funnel the bourbon back into the bottle. That’s it! Now you have bourbon that tastes like bacon. Believe it or not, we’re only scratching the surface of what you can do with bacon grease. A quick Google search will reveal hundreds of cooking recipes, practical applications, and ever weirder ideas than these ones. Next time you’re thinking about pouring your bacon grease down the drain, imagine you could do with it instead! We understand how hard old habits are to break, however. Case-in-point: we’ve been trying to cut down our bacon eating, but we can’t seem to stop writing about it. If you end up pouring some bacon grease down your drain, give Mike Diamond a call right away. We’re happy to help clean it out.